I get my ideas from everywhere. But what all of my ideas boil down to is seeing maybe one thing, but in a lot of cases it's seeing two things and having them come together in some new and interesting way, and then adding the question 'What if?' 'What if' is always the key question. But could it really be that simple? The question of where successful authors get their ideas is the one that keeps the aspiring writers up at night. It's the one that makes you feel like you're missing something, especially when writer's block sets in, or you've written yourself into a corner. As tempting as it is, don't ever let yourself believe that household names like Stephen King, Margaret Atwood, and John Green don't experience the banal writing problems the rest of us have. And don't go looking for magic story beans that will grow into one giant beanstalk of a novel overnight. They don't exist. There's no big secret to finding great story ideas. Sometimes they catch you by surprise, but you might also have to go digging for gold every once in a while. Don't believe me? 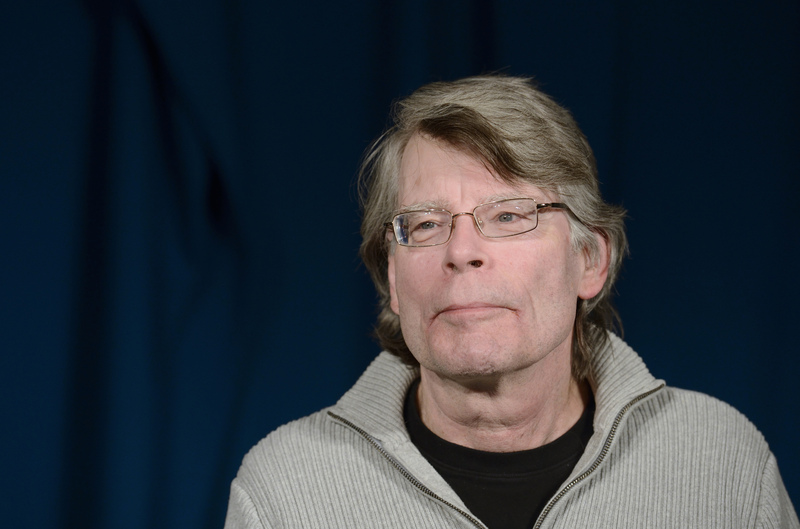 Check out the tiny sparks that turned into great, creepy stories for Stephen King below, and then go mining for your breakout novel. When he was still a high school English teacher, King taught Bram Stoker's Dracula, which both he and his students enjoyed. He wondered what would happen if an Old World vampire like Dracula came to the modern-day U.S. A large urban area like New York City was out, because, as Tabitha King pointed out, "He'd probably be run over by a Yellow Cab on Park Avenue and killed." But what if he wound up in a small, quiet town instead? Believe it or not, there was once a very real pet cemetery, where children buried the dogs and cats who died in traffic on a busy highway. Sandwiched between the cemetery and the highway was King's house in Orrington, Maine. After burying his daughter's run-over cat, and whisking his young son away from the dangers of the busy road, King was inspired to write Pet Sematary, about a family who experiences similar events, with tragic and horrifying results. During a cross-country trip in 1991, King drove through sleepy Ruth, Nevada, which looked like a ghost town. His immediate thought was that everyone in the town was dead, and he wondered who killed them. His interior Voice answered: "The sheriff killed them all." He was further inspired to start work on Desperation during the Insomnia book tour in 1994. The companion novel to Desperation, The Regulators, was inspired by a sticker on King's printer. After wondering who or what "The Regulators" could be, the idea came to write it as a Bachman book with the same cast from Desperation. The Regulators contains a number of jokes and references to the first novel. The unfettered greed and tarnished opulence of the 1980s inspired his 1991 novel about a curio shop that sells your heart's deepest desires at prices too good to be true. In the Eighties, everything was for sale, including "honor, integrity, self-respect, and innocence." King says he "decided to turn the eighties into a small-town curio shop called Needful Things and see what happened," but admits that Needful Things "didn't review well. ... The readers liked it, though, and that's what matters to me." When the Kings stayed at Estes Park, Colorado's Stanley Hotel, they were the only guests in the building, having booked the very last days of the hotel's season. King suspected that a large, vacant hotel might be "the perfect — maybe the archetypical — setting for a ghost story." After he woke up in a sweat from a dream about his son Joe being chased down the hotel corridor by a fire hose, King remained awake and began to construct the story of the Torrance family's brush with the supernatural. A 1987 trip to his laundry room inspired this novella, which was later adapted into the 2004 film, Secret Window. Kings' laundry room had a floor-level window, that, in the 11 or 12 years he'd spent living in the house, he "had never taken a good hard look out" of. Tabitha had recently set some potted plants out in the alcove that window overlooked, and so King saw "a charming little garden which only [he] could see." It's almost too simple, too glaringly obvious, to think of seeing things from a different angle as a metaphor for writing, but that's exactly what King did. Turning the idea over in his mind, the author produced this novella, about a writer who suffers a series of traumatic experiences after he's accused of plagiarism. J.R.R. Tolkien's Lord of the Rings inspired King to write his own fantasy epic. He wrote two: the Dark Tower series and The Stand. Two news stories helped to inspire King's riveting tale of good vs. evil in an American wasteland. One was a 60 Minutes segment on chemical-biological warfare, which featured footage of lab mice suffering quick and painful deaths. The other was a chemical spill that wiped out a herd of sheep in Utah, and prompted a news reporter to remark, "If the winds had been blowing the other way, there was Salt Lake City." A story about the infamous BTK serial killer, identified in 2005 as Dennis Rader, inspired this novella, included in King's 2010 collection, Full Dark, No Stars. After Rader's capture, many wondered how his wife could have lived with him for decades and remained unaware of his gruesome compulsion. Many still believe she must have been in on her husband's nasty secret. King doesn't, however, and that unpopular opinion produced A Good Marriage. Fittingly enough for this article, King says that The Dark Half was his attempt "to answer the question ‘Where do you get your ideas?’" He ran into some trouble trying to devise the ending, but a murder of crows and the memory of an H.P. Lovecraft poem inspired George Stark's demise. In 1978 my family was living in Boulder, Colorado. One day on our way back from lunch at a pizza emporium, our brand-new AMC Matador dropped its transmission-literally. The damn thing fell out on Pearl Street. True embarrassment is standing in the middle of a busy downtown street, grinning idiotically while people examine your marooned car and the large greasy black thing lying under it. Two days later the dealership called at about five in the afternoon. Everything was jake — I could pick up the car any time. The dealership was three miles away. I thought about calling a cab but decided that the walk would be good for me. The AMC dealership was in an industrial park set off by itself on a patch of otherwise deserted land a mile from the strip of fast-food joints and gas stations that mark the eastern edge of Boulder. A narrow unlit road led to this outpost. By the time I got to the road it was twilight — in the mountains the end of day comes in a hurry — and I was aware of how alone I was. About a quarter of a mile along this road was a wooden bridge, humped and oddly quaint, spanning a stream. I walked across it. I was wearing cowboy boots with rundown heels, and I was very aware of the sound they made on the boards; they sounded like a hollow clock. I thought of the fairy tale called "The Three Billy-Goats Gruff" and wondered what I would do if a troll called out from beneath me, "Who is trip-trapping upon my bridge?" All of a sudden I wanted to write a novel about a real troll under a real bridge. I stopped, thinking of a line by Marianne Moore, something about "real toads in imaginary gardens," only it came out "real trolls in imaginary gardens." A good idea is like a yo-yo — it may go to the end of its string, but it doesn't die there; it only sleeps. Eventually it rolls back up into your palm. I forgot about the bridge and the troll in the business of picking up my car and signing the papers, but it came back to me off and on over the next two years. I decided that the bridge could be some sort of symbol — a point of passing. I started thinking of Bangor, where I had lived, with its strange canal bisecting the city, and decided that the bridge could be the city, if there was something under it. What's under a city? Tunnels. Sewers. Ah! What a good place for a troll! Trolls should live in sewers! A year passed. The yo-yo stayed down at the end of its string, sleeping, and then it came back up. I started to remember Stratford, Connecticut, where I had lived for a time as a kid. In Stratford there was a library where the adult section and the children's section was connected by a short corridor. I decided that the corridor was also a bridge, one across which every goat of a child must risk trip-trapping to become an adult. About six months later I thought of how such a story might be cast; how it might be possible to create a ricochet effect, interweaving the stories of children and the adults they become. Sometime in the summer of 1981 I realized that I had to write about the troll under the bridge or leave him — IT — forever.